Entrepreneurs, investors, thought leaders, and advocates will gather for the very first crowdfunding conference in the country. Crowdfunding is a revolutionizing way for small businesses to raise capital for their projects and business ideas. It has helped raiseover $5.1 Billion and successfully funded more than a million start-ups worldwide in 2013. By 2025, global crowdfunding platforms are expected to raise almost $90 billion. An increasing number of entrepreneurs and investors are finding this new approach to be more appealing for small businesses. In line with this trend, Enderun Extension, JCI Manila, The Spark Project, and Crowdsourcing Week will hold the first crowdfunding conference in the Philippines--CSW Summit Manila: Philippine Crowdfunding Conference--on 18 March 2015 at The Tent at Enderun Colleges. Crowdsourcing Week (CSW) is an international conference held in different cities such as London, Geneva, Tokyo, and Singapore. This event will be the first CSW Summit in Manila. Participants of this conference will understand the latest trends in global crowdfunding. They will also learn how to build a successful campaign and discover the different business opportunities in the Philippines. Hear how this platform is used straight from crowdfunded businesses like CarrierPro, ProTEES Project, Kawil Tours, and AV Manila Creative Production Company. Investors may also attend this conference to understand how they can benefit from a crowdfunding program. “Crowdfunding is a relatively new concept in the Philippines and this conference is a great way to educate up-and-coming entrepreneurs and investors about the potential of this funding alternative,” CEO and founder of TheSpark Project Patch Dulay said. Over 150 entrepreneurs, NGO companies, philanthropists, and crowdfunding supporters are expected to attend the conference. Thirteen speakers who are entrepreneurs and crowdfunding supporters will be in attendance including EpiLudvikNejak (CEO and founder of Crowdsourcing Week), Maria Ressa (former CNN lead investigative reporter and CEO of Rappler, Inc.), Senator Bam Aquino, Ron Hose (CEO and founder of coins.ph), Atty. Francis Ed Lim (Senior Partner at ACCRALAW), Kenneth Reyes-Lao (CEO and co-founder of giftlauncher.com), Dulay, Paolo Agloro (Co-founder of The Spark Project), Jason Torres (CTO and co-founder of artisteconnect.com), Gian Carlo Rosales (CEO and founder of CarrierPro), Napoleon Garcia, Jr. (CEO and founder of ProTEES Project), Guido Sarreal (Founder of Kawil Tours), and BaniLogroño (Film Director at AV Manila Creative Production Company). 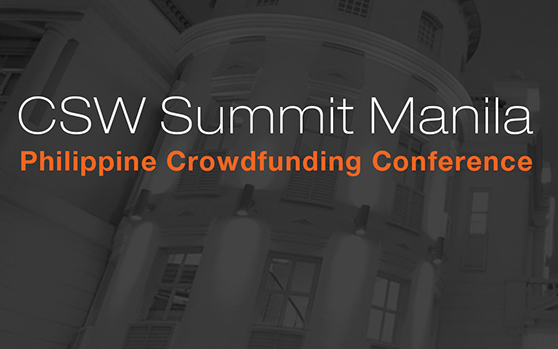 For more information about CSW Summit Manila: Philippine Crowdfunding Conference, visit crowdsourcingph.com or call 856.5000 local 525. Entrepreneur Philippines is among the media partners of this event.